First roasting the peanuts at around 240 degrees Celsius (464 degrees Fahrenheit). At this stage, the peanuts turn from white to light brown. The peanuts are then cooled rapidly so that they don’t continue to cook and so that the natural oils remain in the peanut. They are then blanched with the blancher machine removing the skins and splitting the kernels and removing the heart at the center. The skins are typically then sold for pig food and the hearts for bird food. The split peanut kernels are then dropped into a grinder where they are slowly ground into a paste. This is done slowly to make sure the peanuts don’t heat up too much in the grinding process. Additional ingredients are then added to the peanut paste, such as sugar, salt, and hydrogenated vegetable oil. 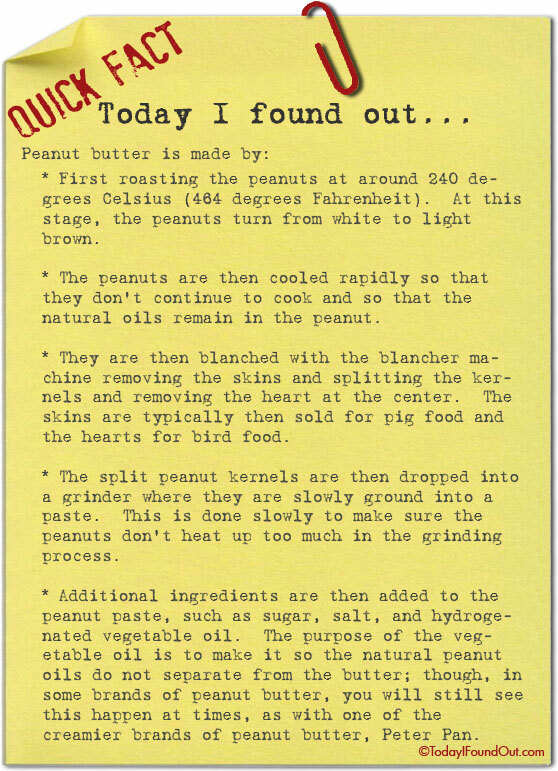 The purpose of the vegetable oil is to make it so the natural peanut oils do not separate from the butter; though, in some brands of peanut butter, you will still see this happen at times, as with one of the creamier brands of peanut butter, Peter Pan. Today I found out that there is something called peanut hearts.